Prairie Sign, a division of Electra Sign, is pleased to be one a hole sponsor for JDRF Golf’s “Chipping in for the Cure”. They have helped raised over $52,000 in their 5th annual Juvenile Diabetes Charity Golf Tournament which makes the foundation the largest non-walk, non-ride fundraiser for JDRF in Canada! As one of their sponsorships, Prairie Sign was granted the opportunity to have their corporate logo posted proudly at the events’ T-Box. There are over 65,000 Saskatchewan residents directly impacted by diabetes. We are confident each of us personally knows a family member, friend, or coworker affected by diabetes. In addition to the great personal cost, this disease is estimated to cost the Canadian health care system and economy, through lost productivity, some $9.2 billion annually. Proceeds from this event will contribute directly to finding a cure for Type 1 Diabetes. To show their support for DOMO as long time respected customer Electra Sign’s Winnipeg offices and Regina’s Prairie Sign offices held a BBQ’s in Domo’s honor to say thanks. Along with the good food, every employee of Electra Sign and Prairie Sign were presented with Gift Certificates to fill there cars with DOMO gas as a show of support. 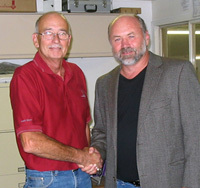 Ken Devine and the staff of Electra Sign Ltd. of Winnipeg wish to announce as of September 1st, 2008 we will acquire Prairie Sign Services. Prairie Sign Services of Regina Saskatchewan is a 30-year-old sign manufacturer that is a respected industry leader which currently enjoys the position of being by volume the largest custom sign manufacturer in its region. Phil Moller founder and President of Prairie Sign will be continuing on in a consultative role during the transition and will continue to play an ongoing role on major projects. Electra Sign looks forward to working with the existing staff and suppliers at Prairie Sign and integrating its leading edge manufacturing and product technology to benefit all Prairie Sign’s existing and future customers.